BrooklineCAN: Who are we? What do we do? Panel presentation at 100 Centre Street on Monday, January 30, 2017. Matt Weiss, Kerri Ann Tester, and Susan Granoff listen as Molly Turlish reviews the history of BrooklineCAN. Photo by Laura Baber. 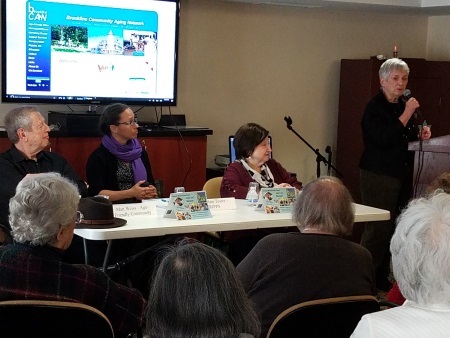 About 35 residents of 100 Centre Street listened as four active members of BrooklineCAN shared our history and efforts to make Brookline an even better place to live for seniors and everyone. Panelists described three current projects that show the depth and breadth of how we work. Membership Chair Molly Turlish organized the meeting and moderated. Panelists Susan Granoff (pedestrian safety), Kerri Ann Tester (TRIPPS), and Matt Weiss (Age-Friendly Cities TV) described projects they are involved with and why participating is meaningful to them. About half of the hour-long presentation was devoted to questions and interaction. All attendees were encouraged to join BrooklineCAN to support current projects and to have a voice in new areas where advocacy and education could make a difference.